The facts speak for themselves: Increasing numbers of U.S. citizens believe that income inequality is a serious problem that requires government intervention. More and more states – even Republican-leaning ones – are passing, or seriously considering, laws imposing minimum wage increases. Because pay is a major issue related to engagement, one might expect us to take a stance in favor of higher minimum wage legislation. The fundamental arguments related to minimum wage laws, we believe, differ from those related to economics. As a business education organization, it simply isn’t the place of the Enterprise Engagement Alliance to weigh in on a debate that has so many elements outside the realm of business. Moreover, as a non-partisan organization, the EEA is focused on how organizations can benefit from engagement on their own, not on ways engagement should be imposed upon them. 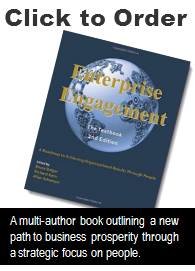 In a world based on Enterprise Engagement, there would be no need for the debate, because companies focused on having highly engaged customers and employees already pay well above prevailing rates, contribute to or pay most health insurance and make ongoing efforts to provide benefits, upward mobility and enrichment opportunities within the organization. These organizations benefit by having a positive employer brand that attracts talent on a word-of-mouth basis, so that they naturally employ better people who stay longer and who, with proper training and communication, create a better customer experience. These companies don’t have to worry about ongoing labor movements picketing their businesses or about large numbers of complaints on social media undermining their brand equity, and they generally have lower legal bills. For these companies, the minimum wage laws might well run against the principals’ philosophical views about the rights of government, but these laws will have little or no impact on their businesses because they run their businesses this way out of self-interest. The big potential mistake for businesses and economists, though, is making the assumption that higher wages automatically pay for themselves. Even the esteemed economist and New York Times columnist Paul Klugman overlooked this point in a recent column. To make the connection between higher labor costs, engagement, and economic benefits, the science is clear: to do so requires not only top management passion but an ongoing strategic effort that the Conference Board’s Engagement Institute’s DNA of Engagement report calls a “formal engagement business plan.” It is, in fact, the 21st Century version of advertising, but instead of being focused on the masses it’s based on connecting with people on a one-to-one basis and on keeping promises (instead of just making them) through a workforce dedicated to customer satisfaction. Should government make companies pay their employees more? We’ll leave that debate to the politicians and voters. Either way, the self-regenerative powers of capitalism could do it for them. Now that social media has put the power firmly into the hands of a marketplace increasingly uneasy with income inequality and mistreatment of employees, and given talented employees more tools to select which companies they wish to work for, many companies may in the end have no choice. Whether government should impose minimum wages on businesses is an issue of course worthy of political debate. What is no longer open to debate is the pressure social media now puts on both politicians and employers to do more for employees. Media reports about employee issues no longer evaporate with the next day’s news cycle – they bounce around social media and end up in search results for years to come. McDonalds recently moved voluntarily to increase pay for workers in company-owned stores after ongoing social media pressure, and it will be curious to see how Disney handles the social media storm around a recent New York Times story about alleged labor practices in conflict with its employer brand. According to the article, Disney replaced an entire team with employees outsourced from India under an immigration visa intended to fill positions for which there is no U.S. talent, and used severance terms to induce many of the fired employees to remain on to train their replacements. Ouch. What is the cost of that blemish on their brand, given all Disney invests to protect it? The ability of social media to magnify the impact of news and an improving economy will put pressure on at least some employers to raise wages and improve employee conditions, whether government imposes it or not, if they just employ what is really simple math: tally up the high costs of customer and employee turnover…it’s a no-brainer.